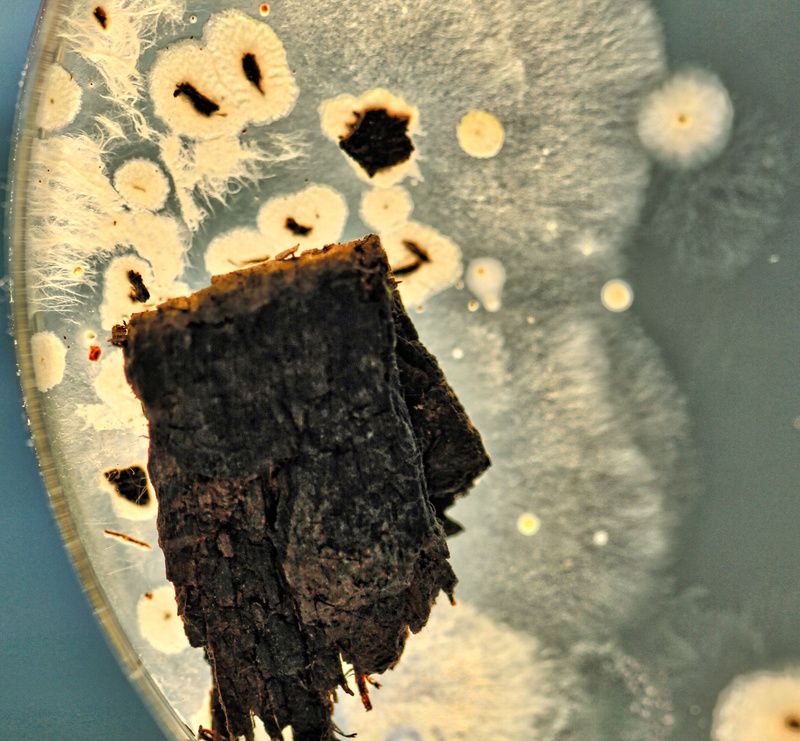 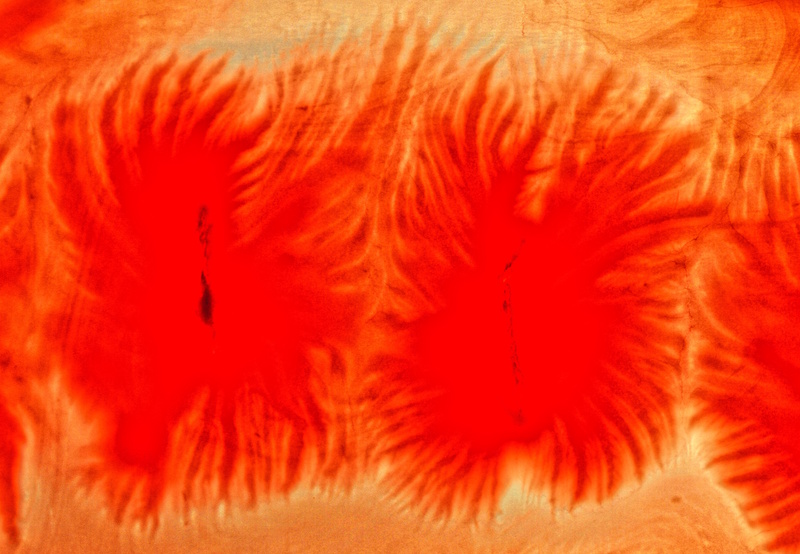 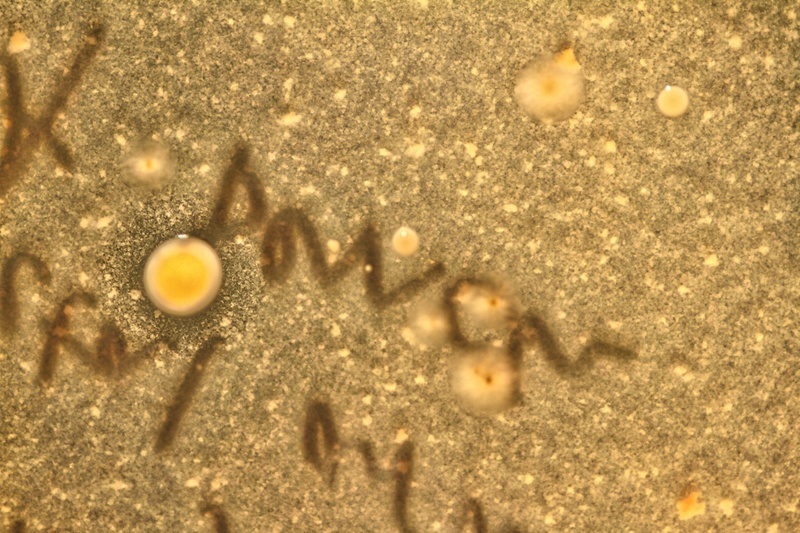 The very common soil bacterium Bacillus mycoides senses and responds to deformations and tensions in its growth environment. 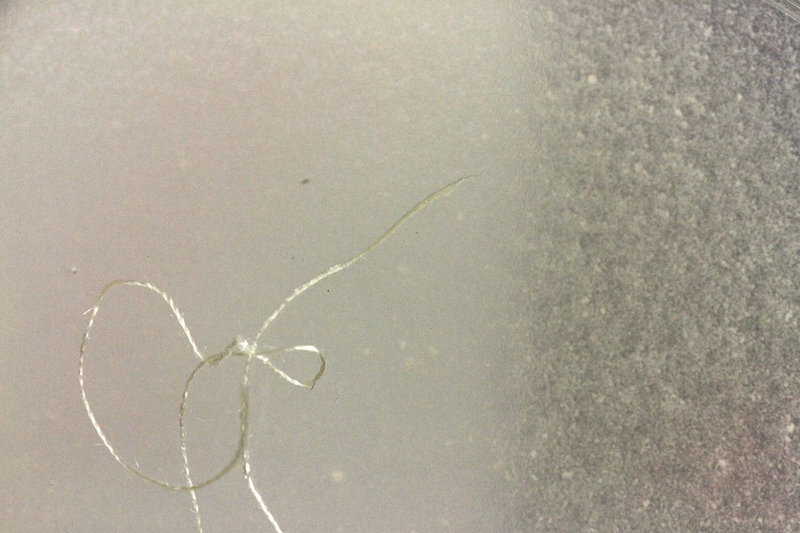 The MUML had its first outing at the fabulous Bees In A Tin event on 12th June at Millennium Point in Birmingham. 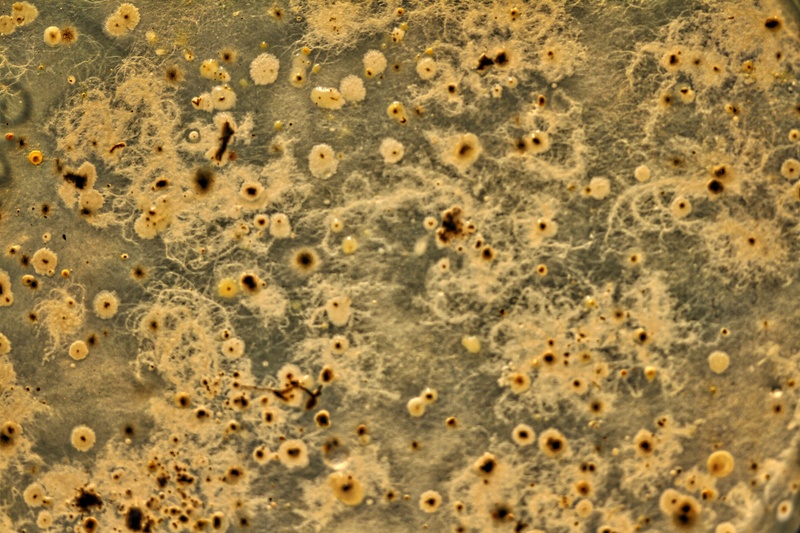 The 90 minute outdoor and mobile workshop comprised a short microgeographical walk, the observation of natural samples for microbes in situ using a portable field microscope (400-1000x magnification) and an iPhone, and some alfresco preparation of DIY/Kitchen microbiological growth media. 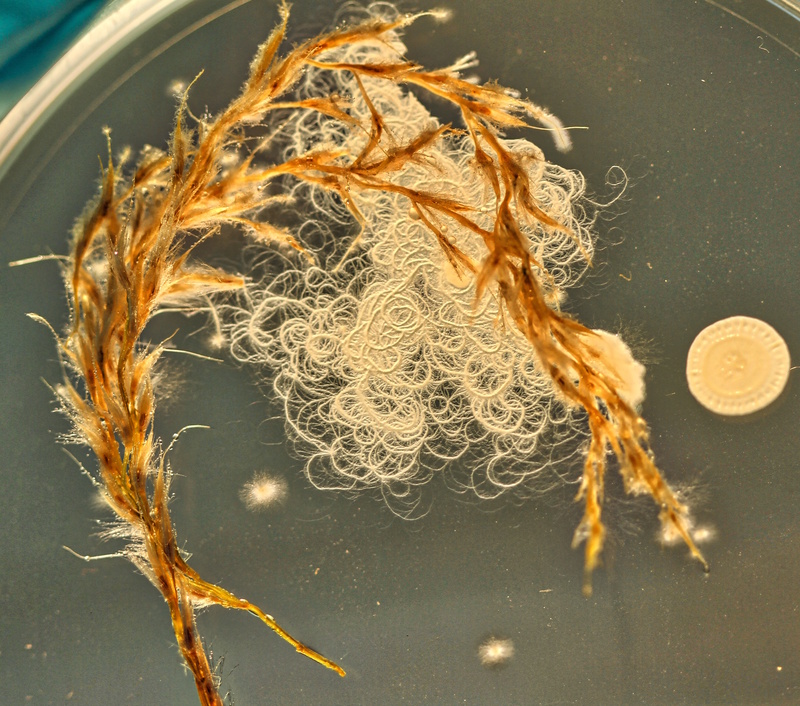 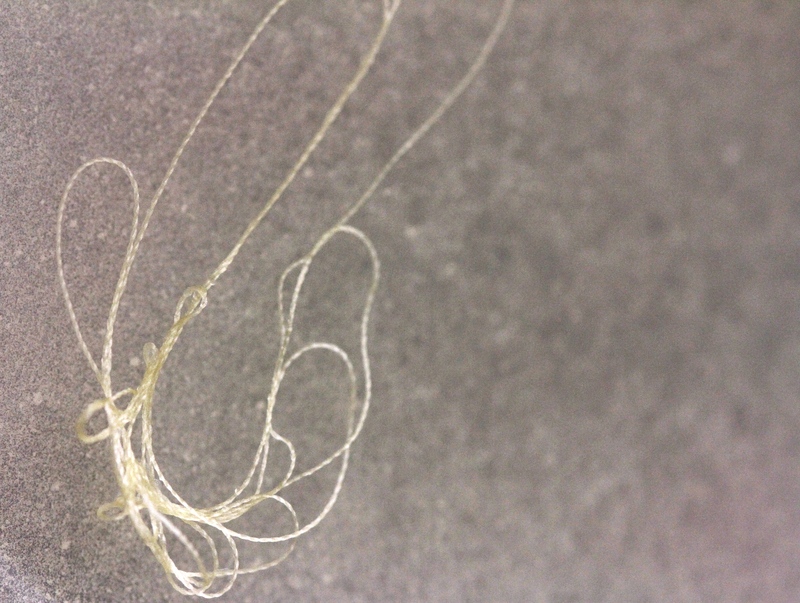 Participants then inoculated the various growth media with found objects of their choice. 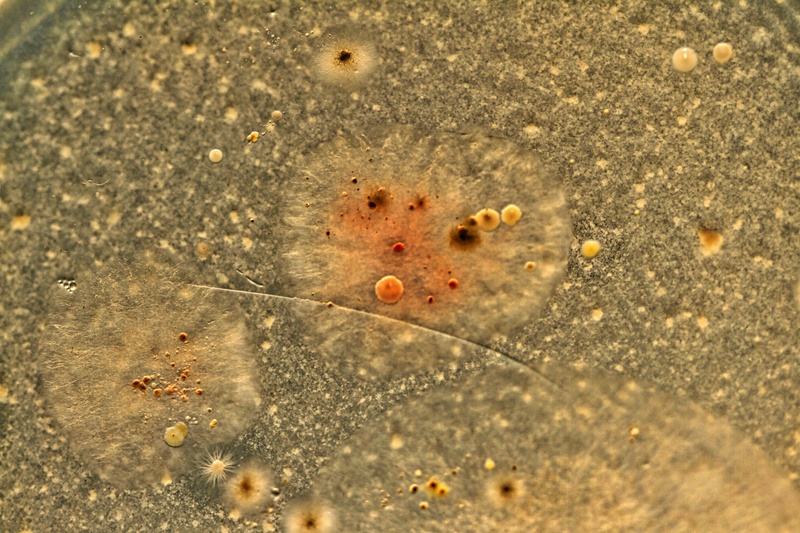 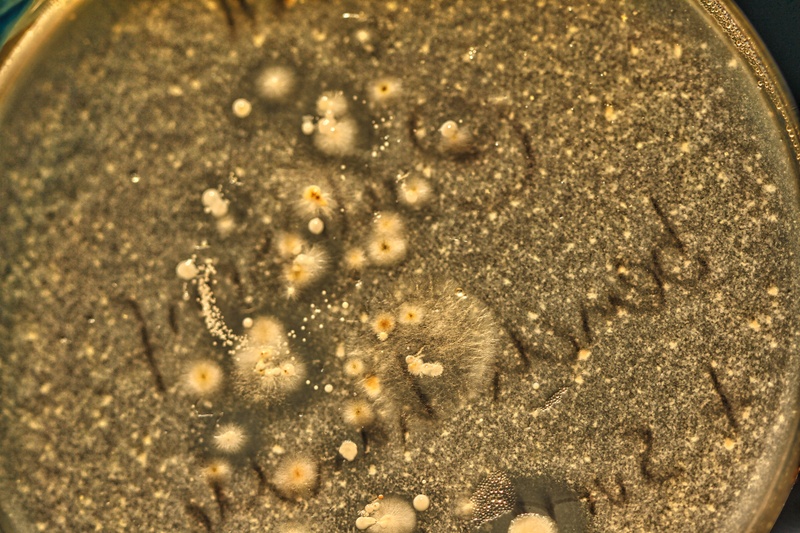 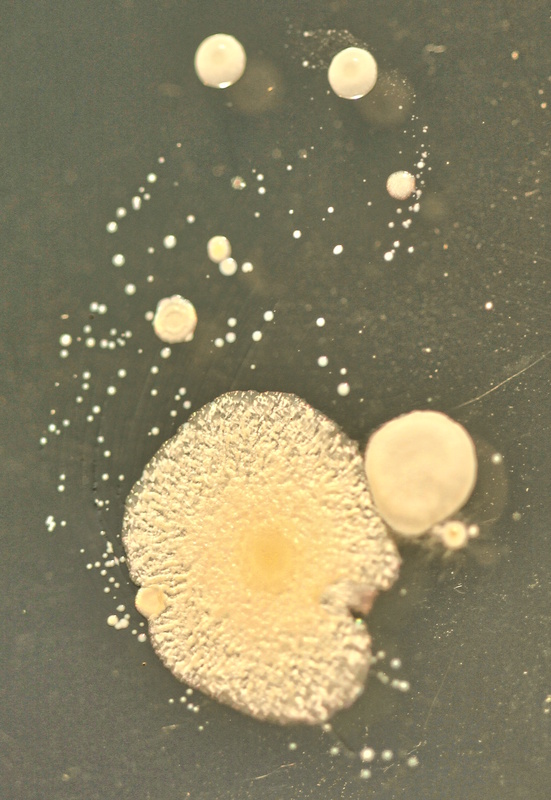 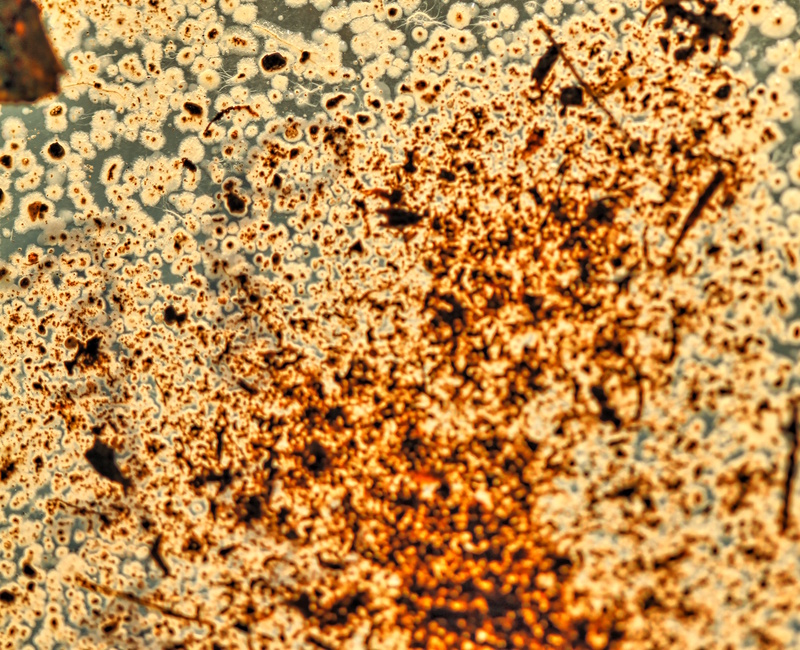 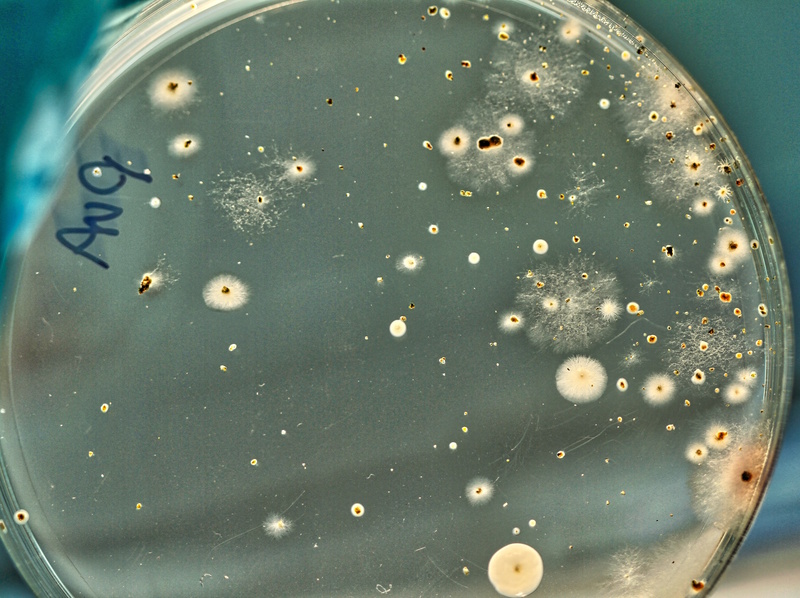 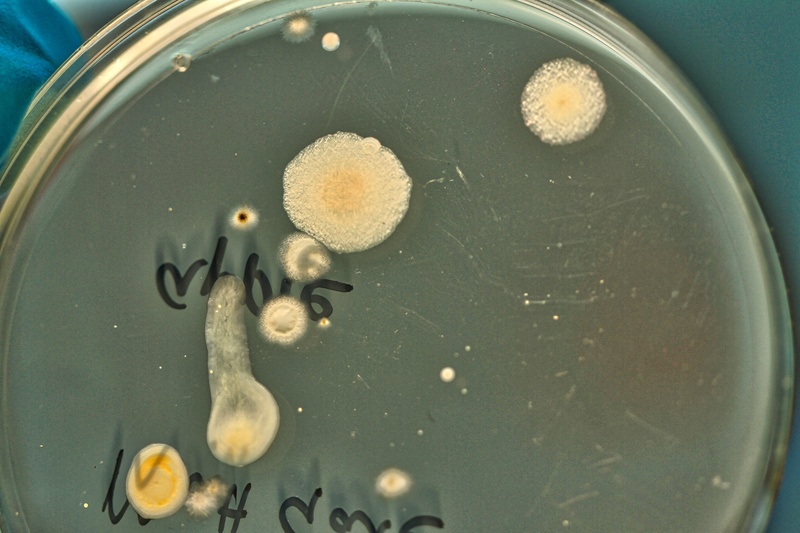 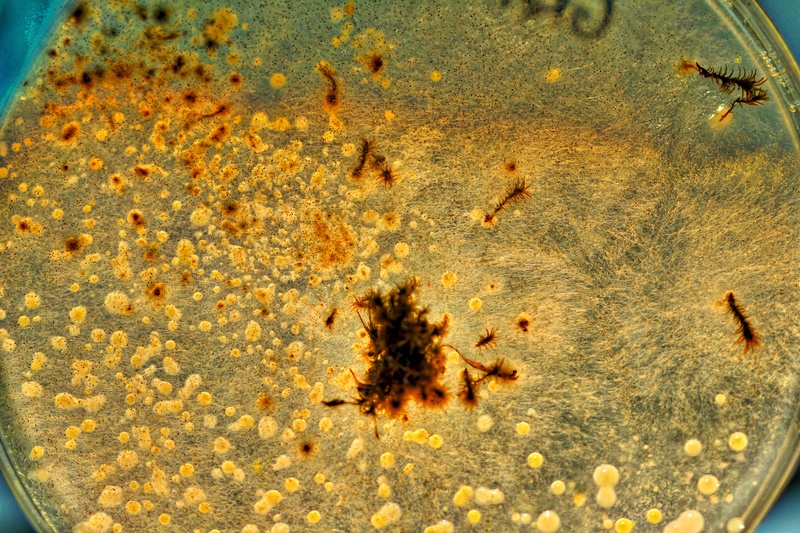 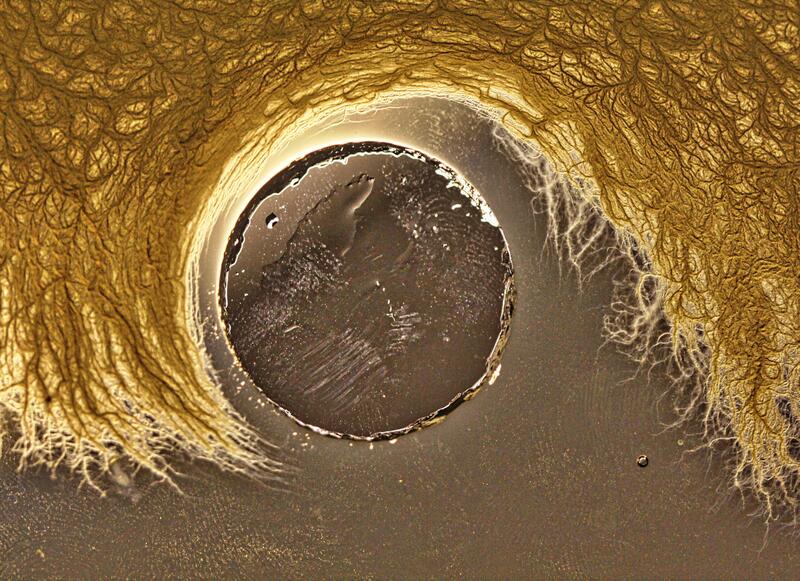 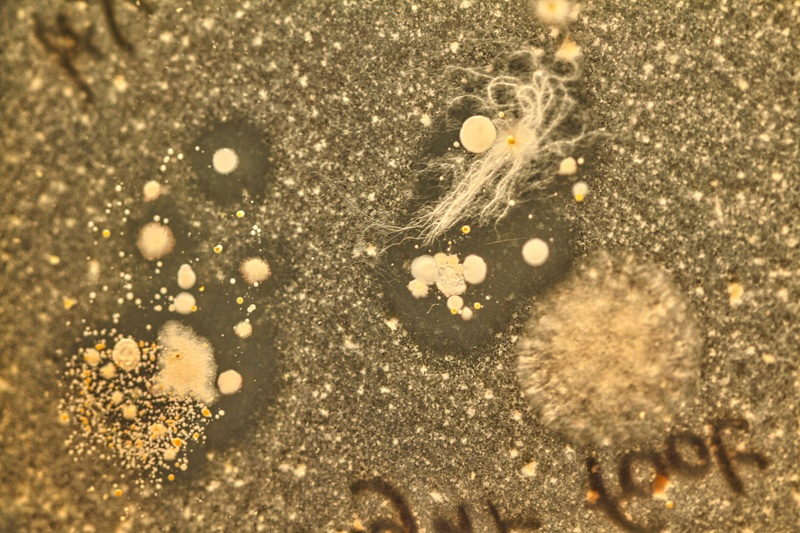 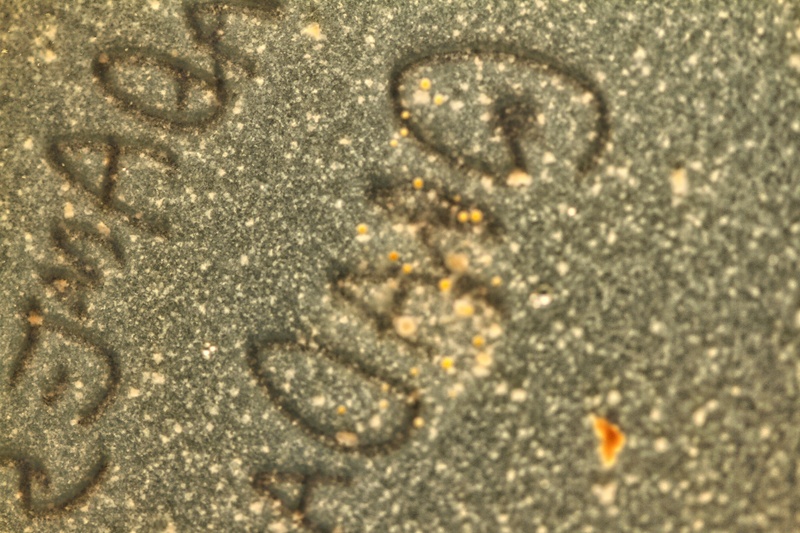 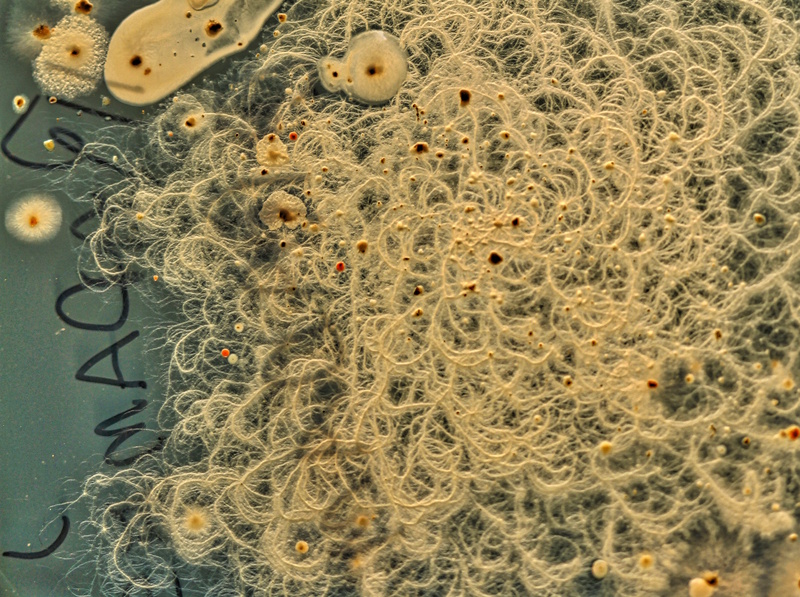 These are images of the microbes (mostly bacteria and a few moulds) that grew on the agar plates. 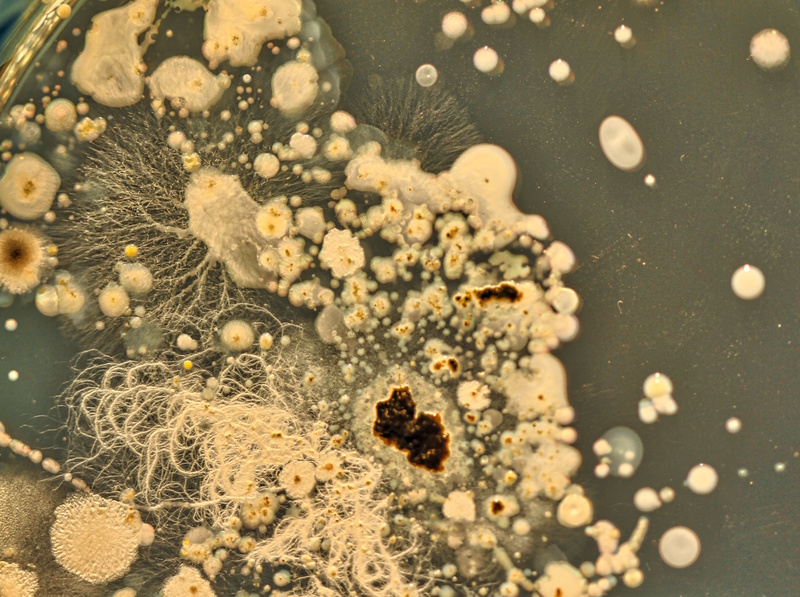 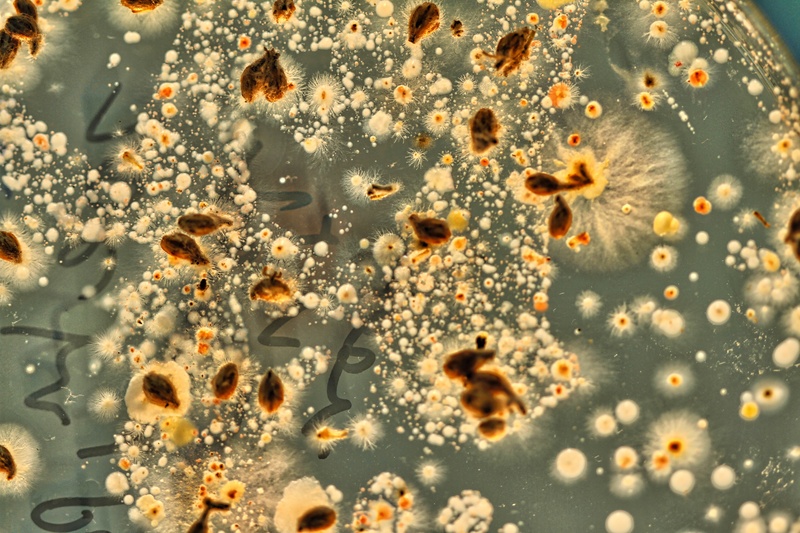 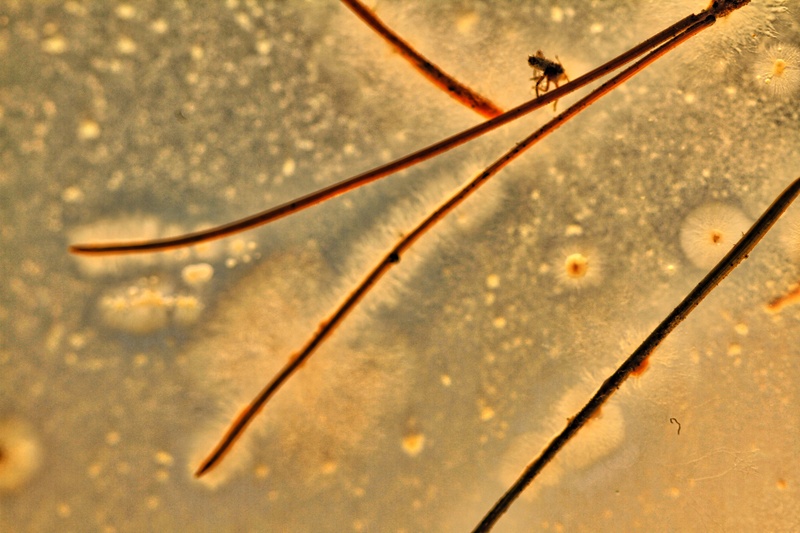 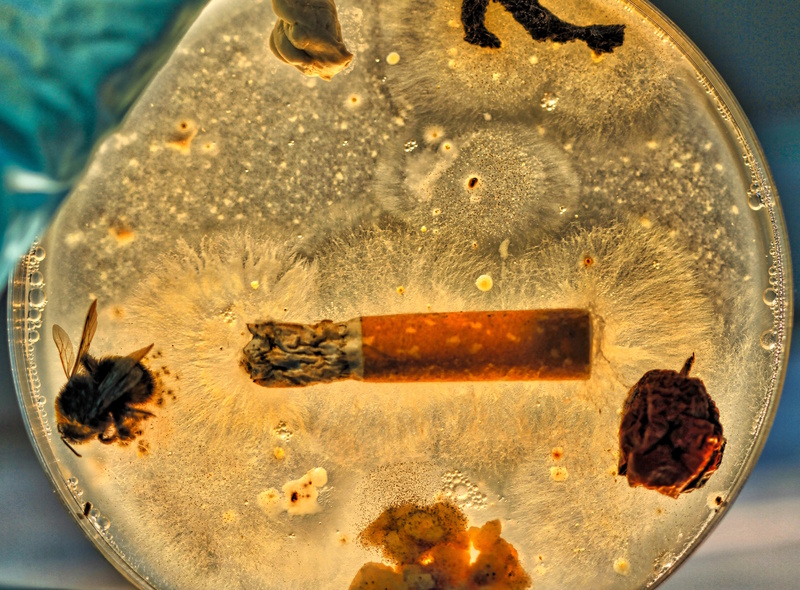 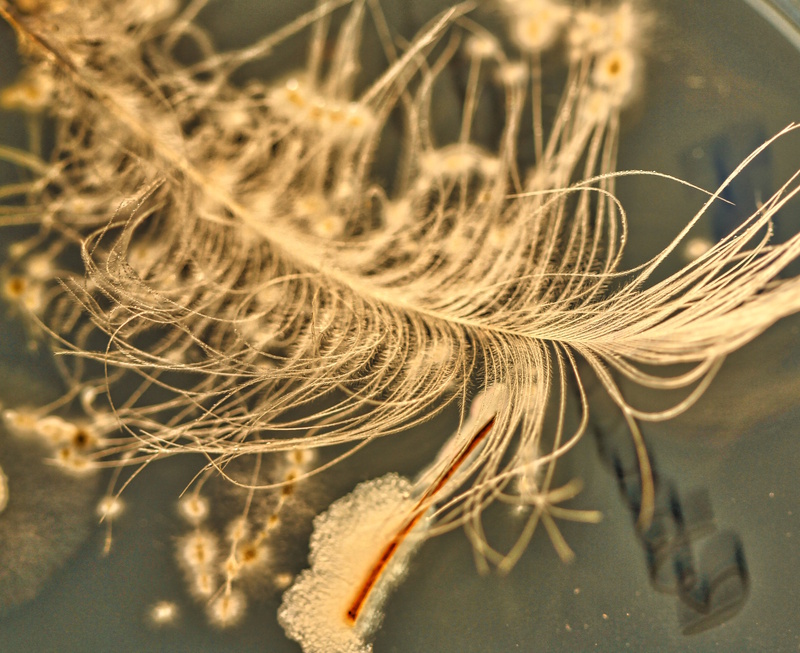 The way that this usually invisible life emerges from the chosen objects, and the complex manner in which seems to embellish these, to me, forms a very potent reminder, of not only the ubiquity of microbiological life, but also its intimate connection with all else. 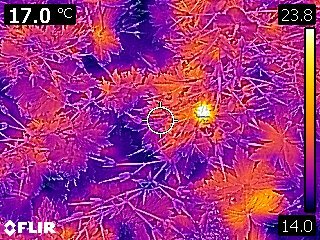 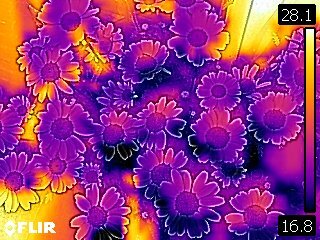 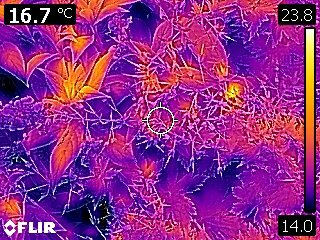 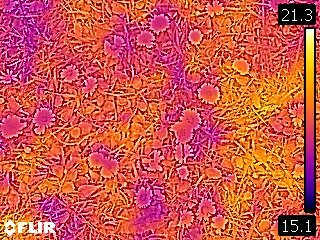 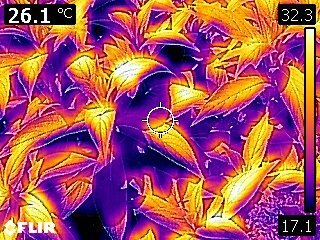 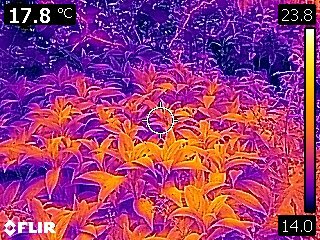 Photographs of our garden taken with a thermal imaging camera. 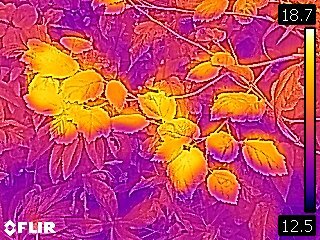 Leaves and flowers become like abstract paintings as differences in temperature become apparent, and Bumbles Bees can be seen as yellow spots of heat energy. 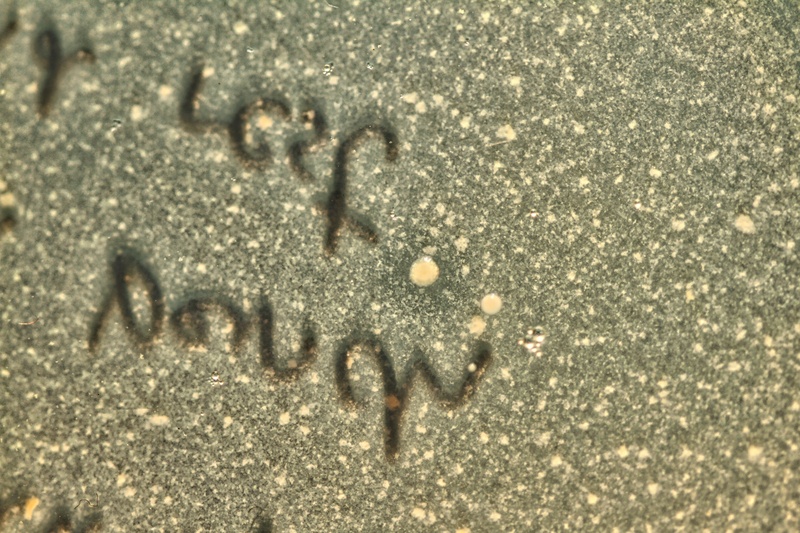 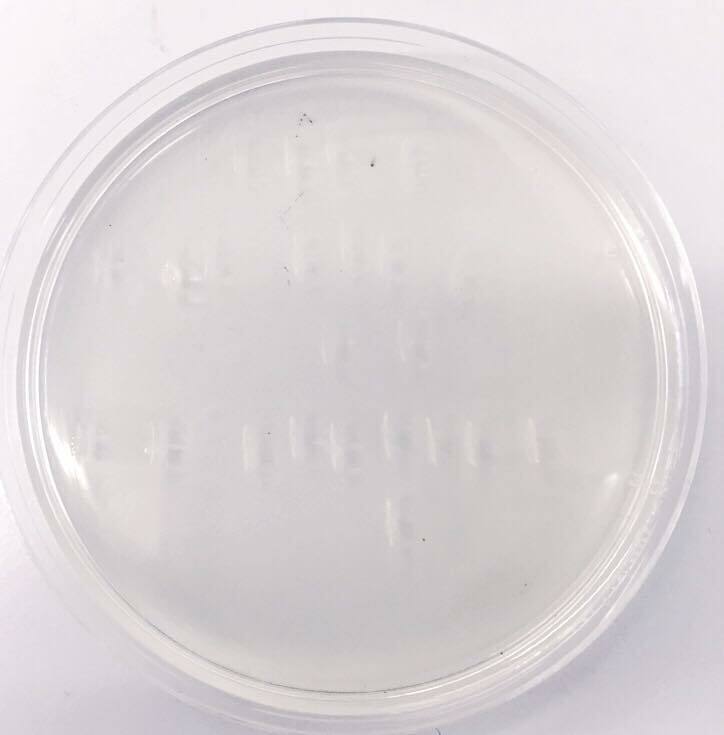 A message encrypted into a bacterial communications system. 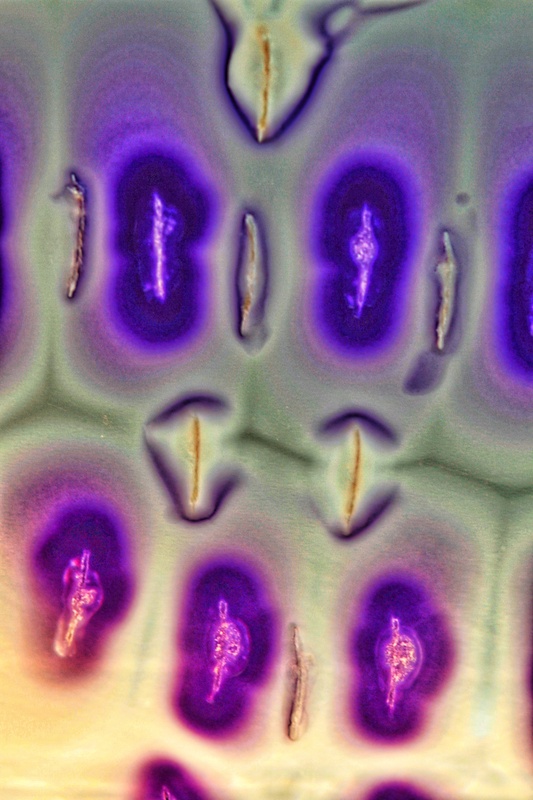 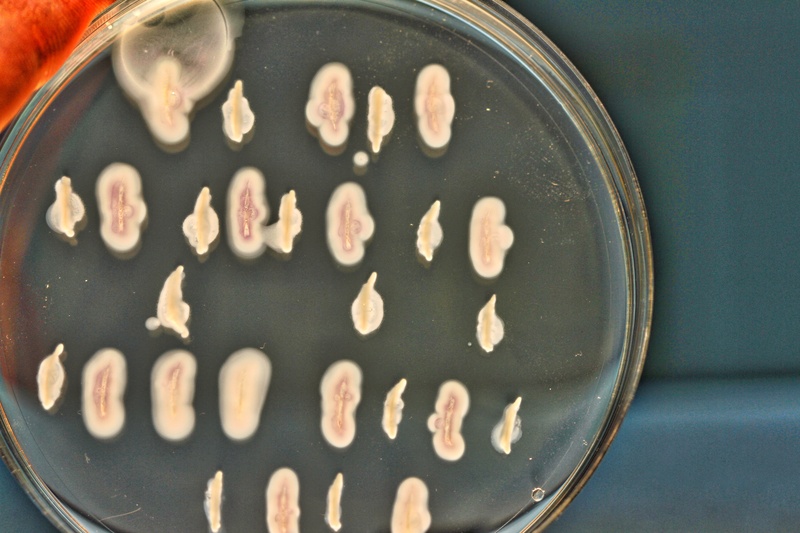 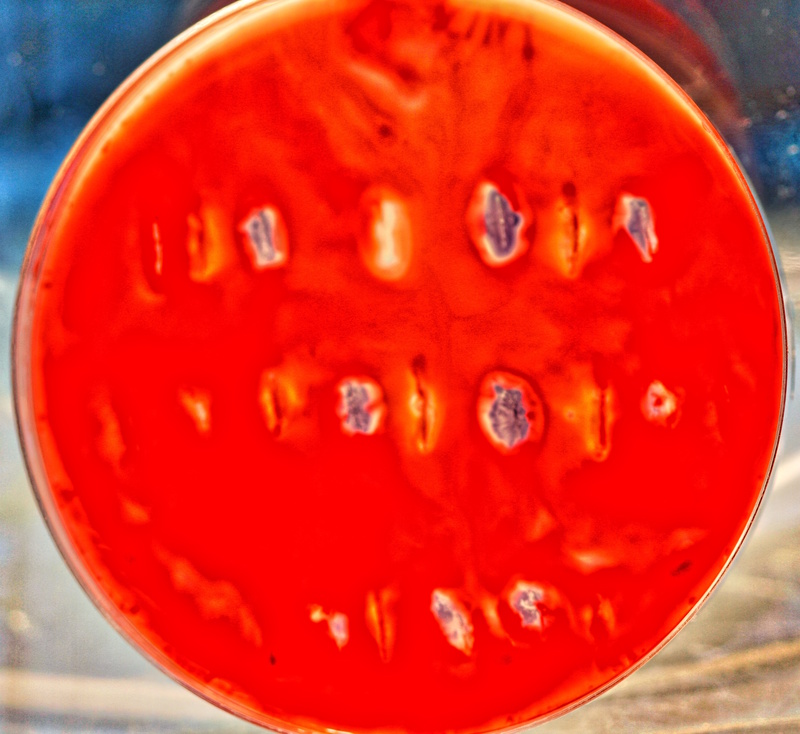 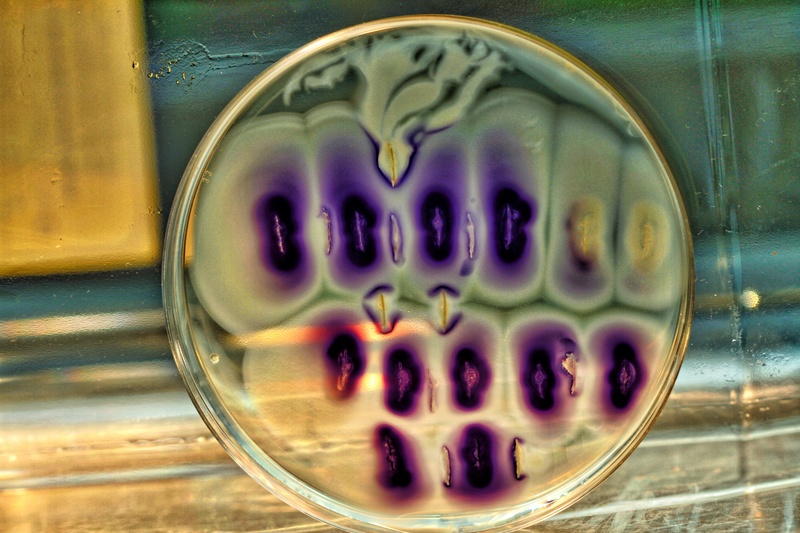 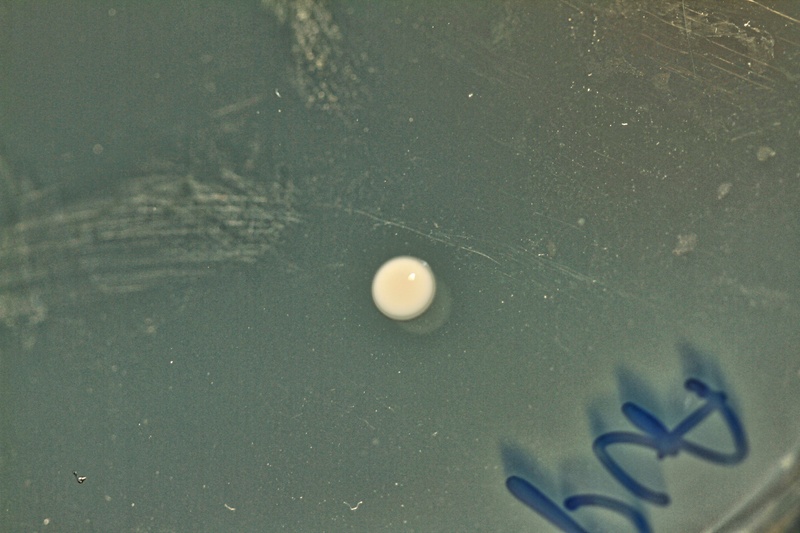 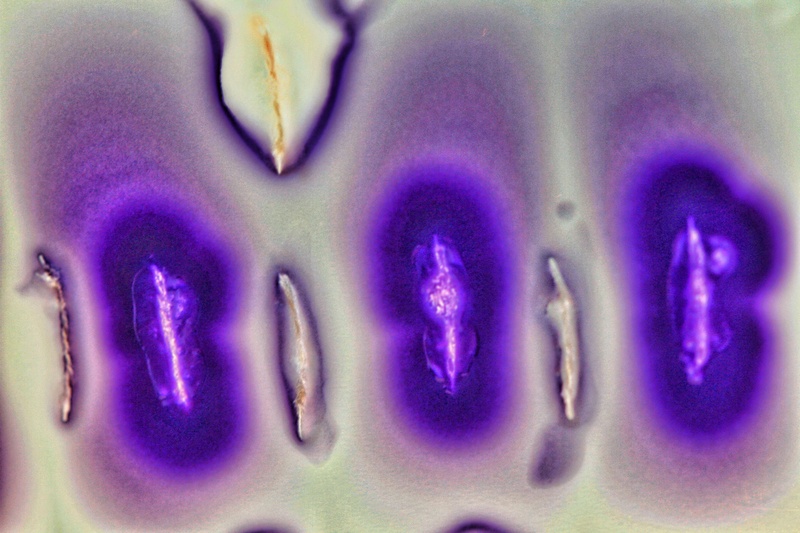 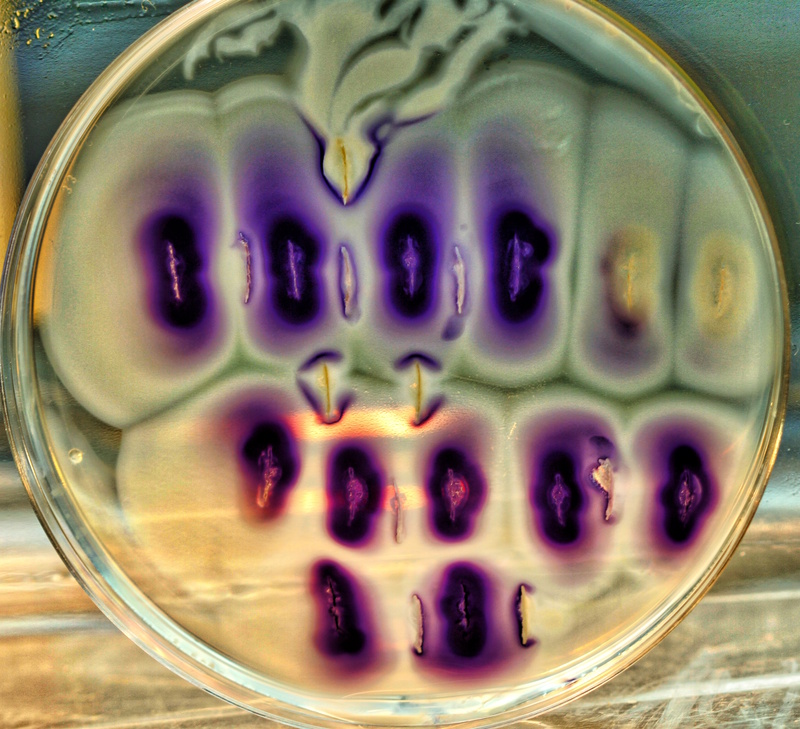 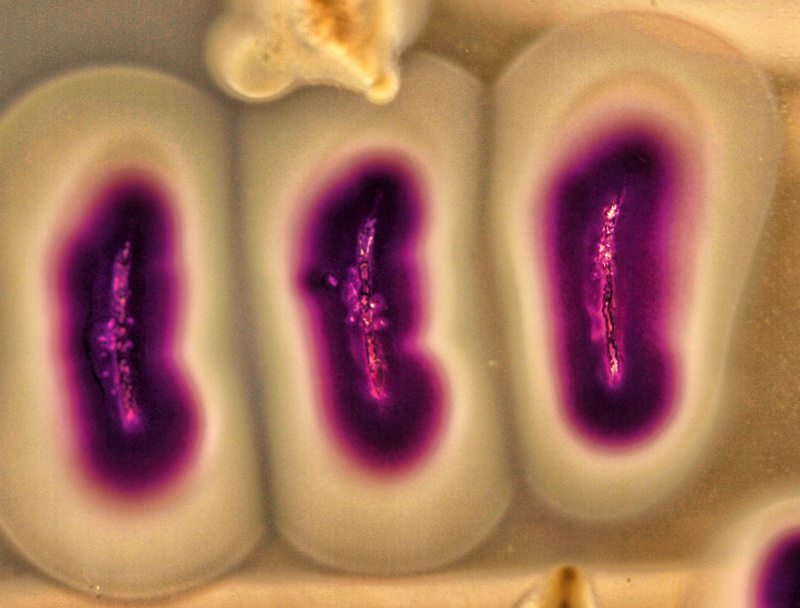 Two initially colourless strains of bacteria interact, and where they meet and communicate, one strain generates a purple pigment. 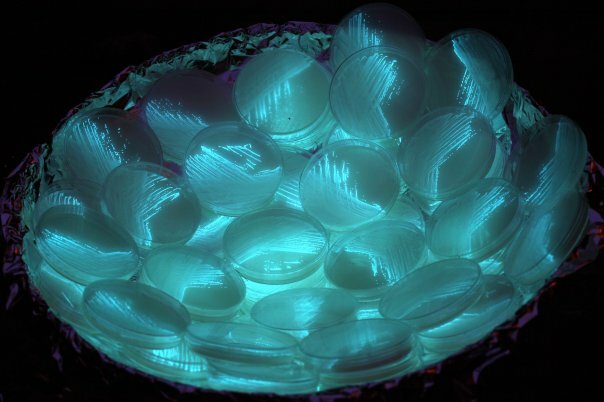 The Bioluminescent Signal Emitting Dish ! 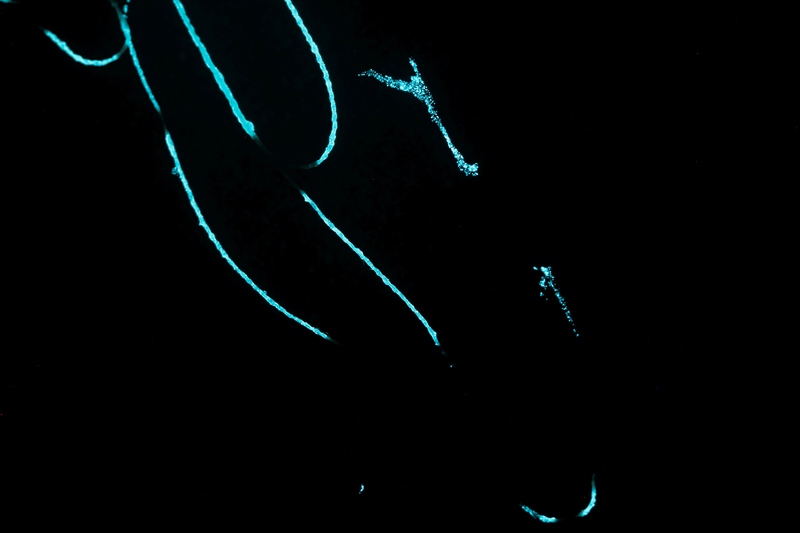 Throughout history, mariners have infrequently reported witnessing bizarre nightime displays where the surface of the sea produces an intense, uniform, and sustained glow that extends in all directions to the horizon. 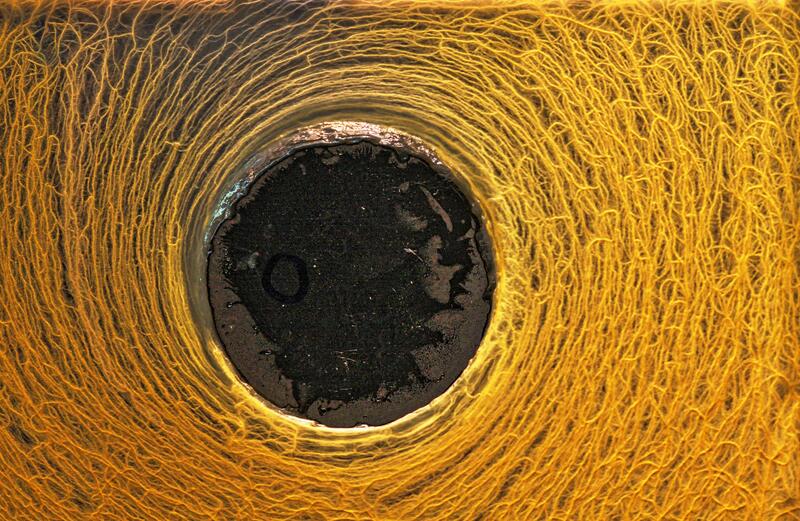 This phenomenon has also occassionally been reported in ship’s logs and there is even a fictional account in Jules Verne’s 20,000 Leagues Under The Sea.  There has been speculation that these events are due to the accumulation of massive populations of natural and marine bioluminescent bacteria and one such “milky sea” was corroborated in 1995 when a satellite imaged a glowing portion of the Ocean, the size of Yorkshire, off the Somalian coast. 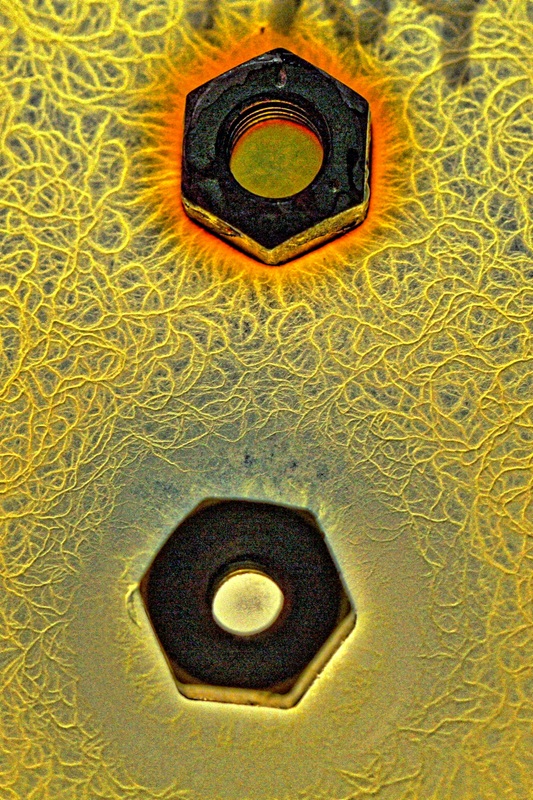 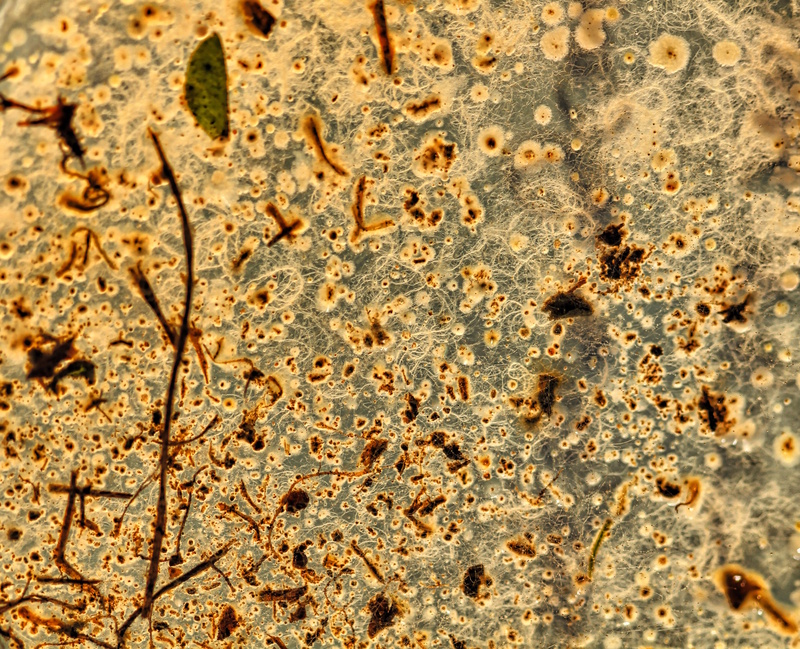 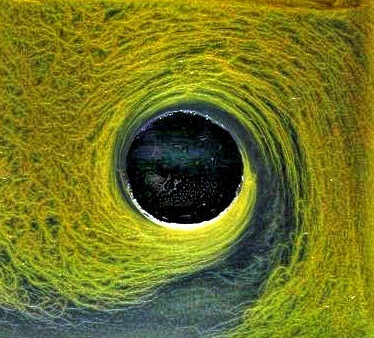 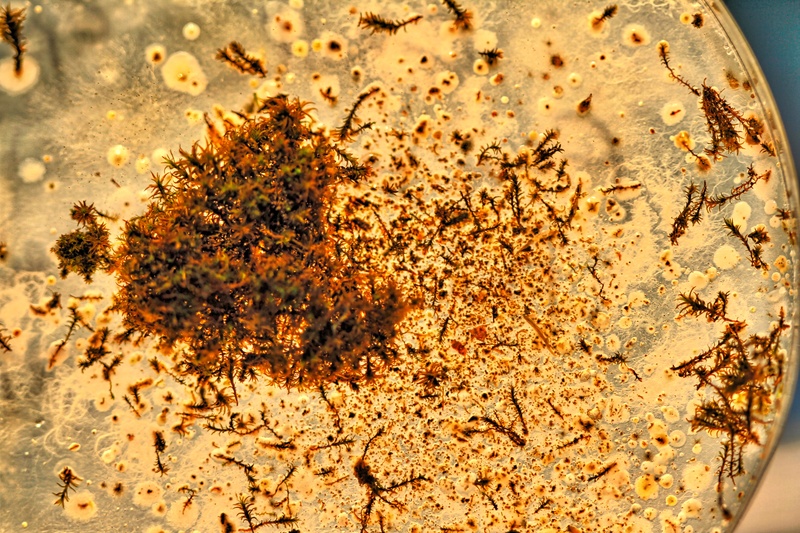 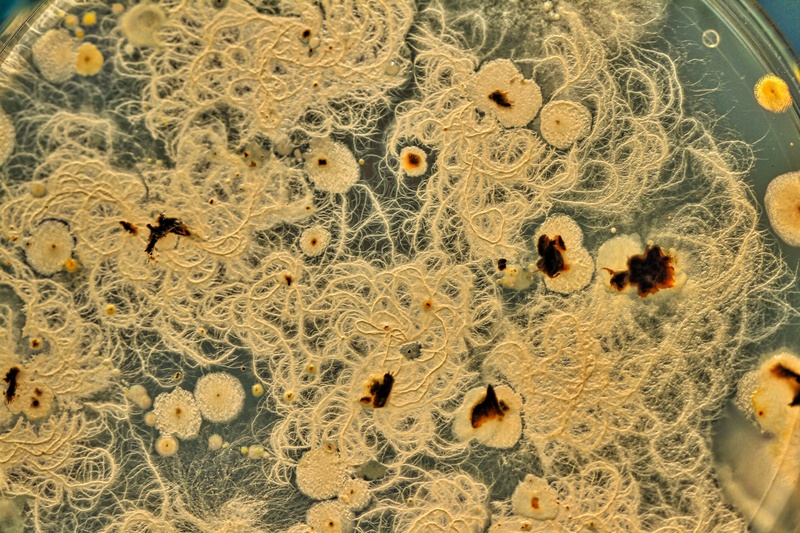 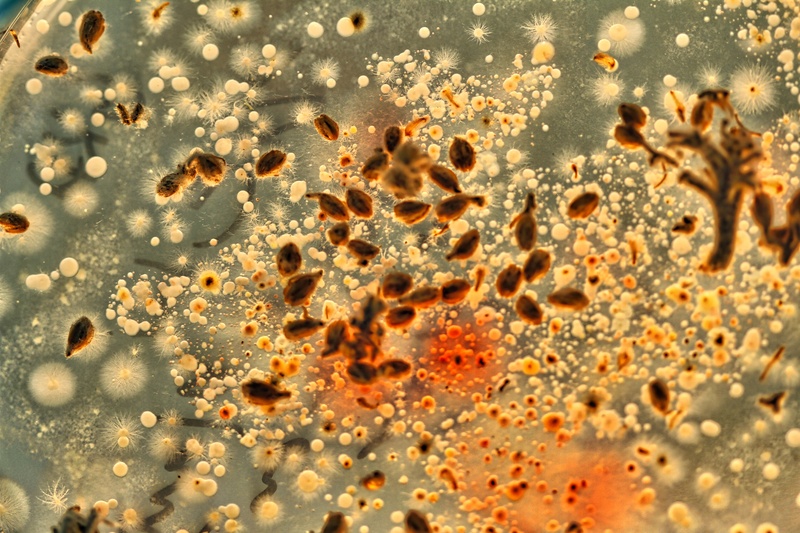 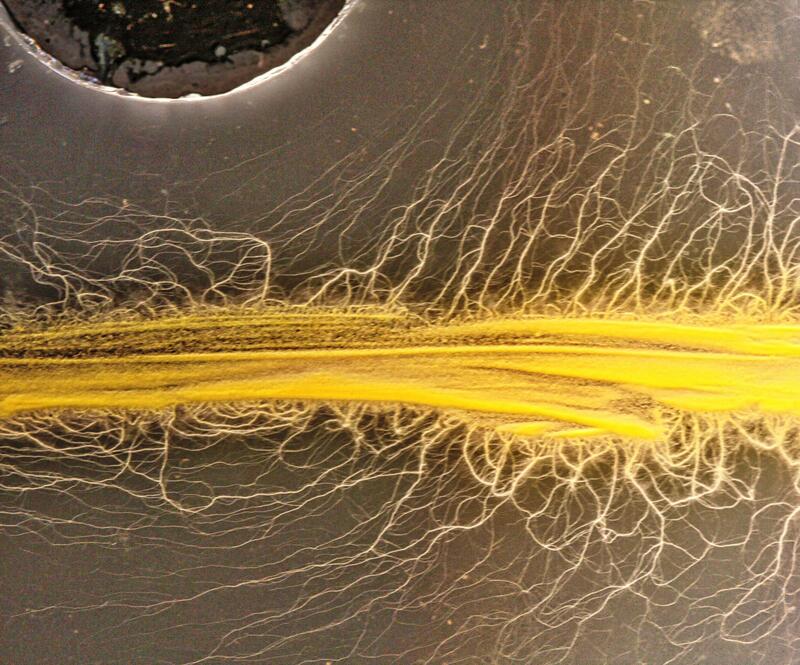 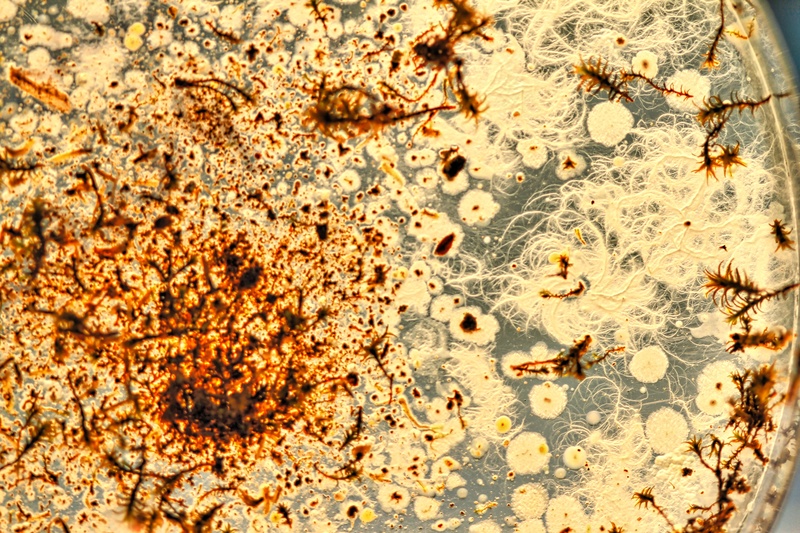 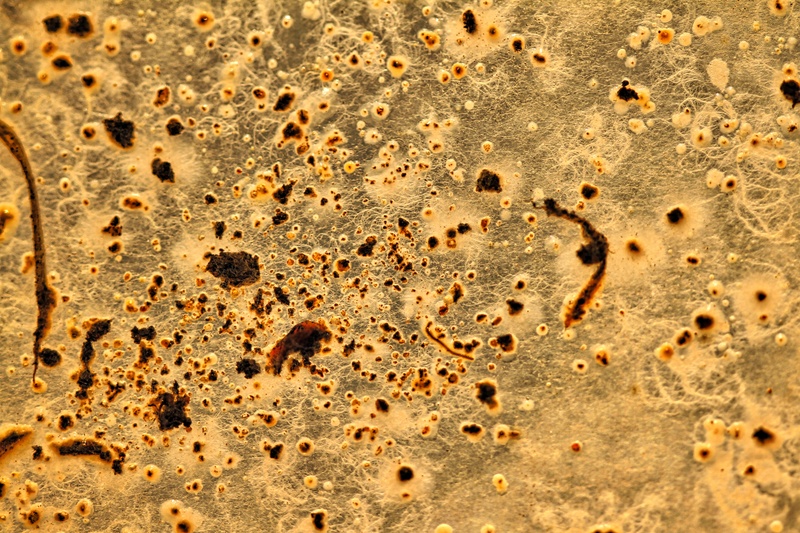 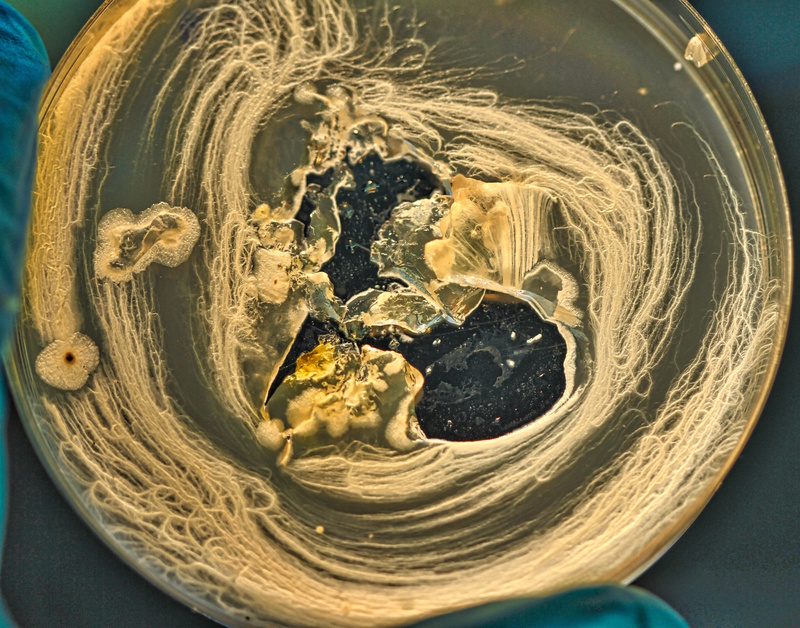 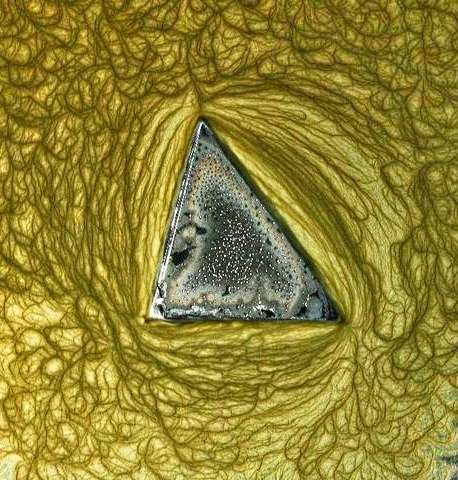 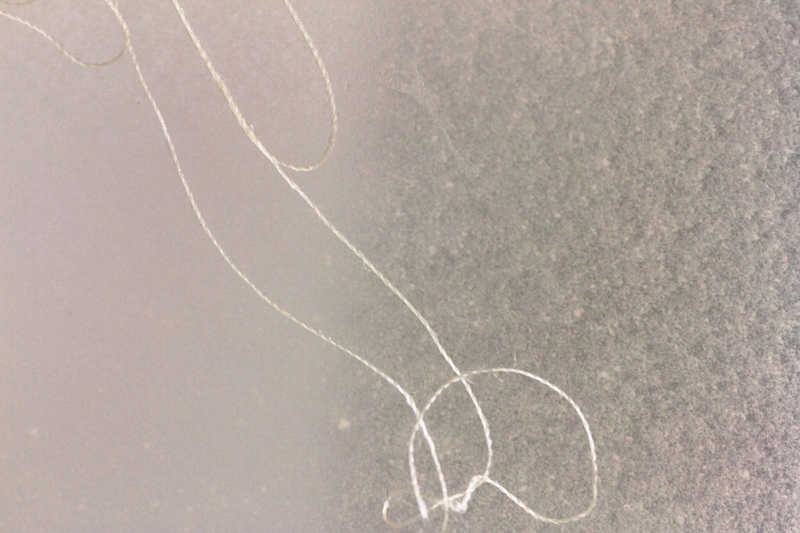 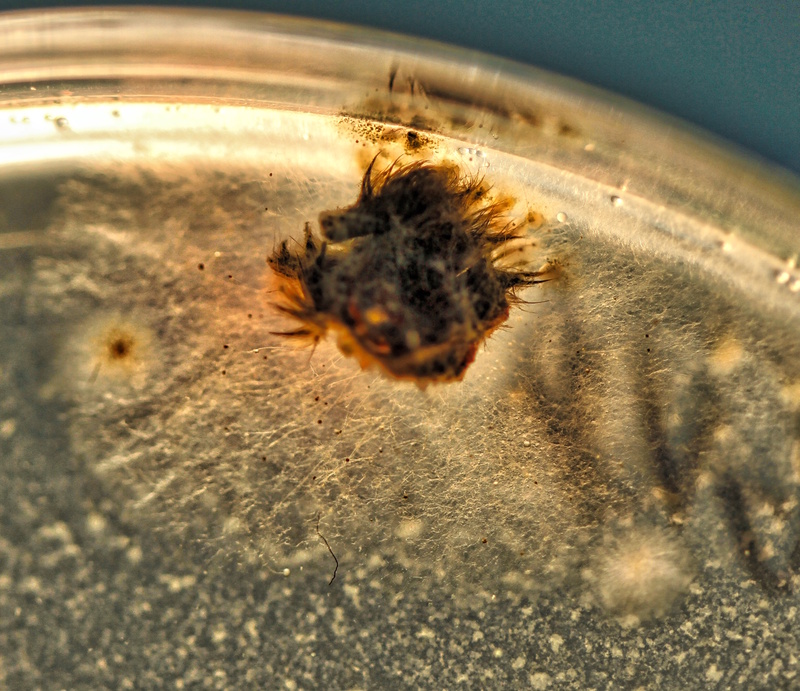 The light then produced by these bacteria obviously can penetrate from the Earth’s atmosphere, and into space beyond, and so a very long time before we developed the ability to do this, bacteria were sending electromagnetic signals into space, and which could be conceivably be detected by extraterrestrials. 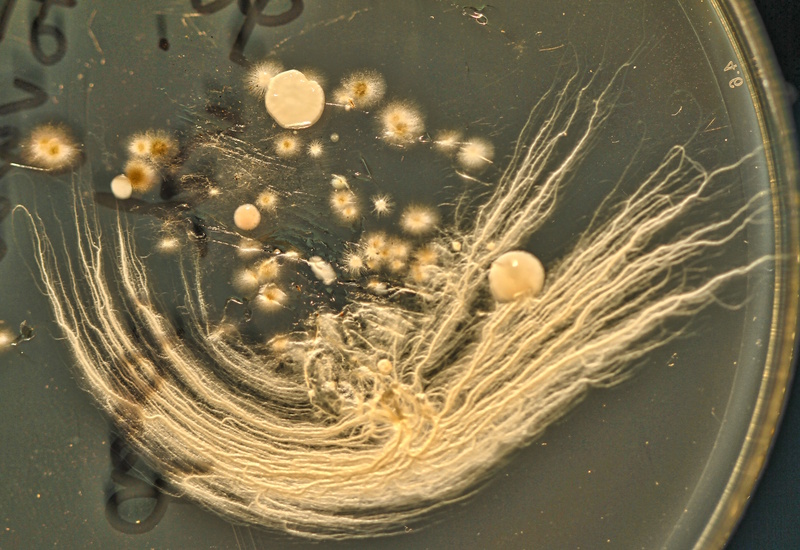 Based on the above findings, this is a largely symbolic, and also very simple, attempt to send a biological electromagnetic signal to other worlds. 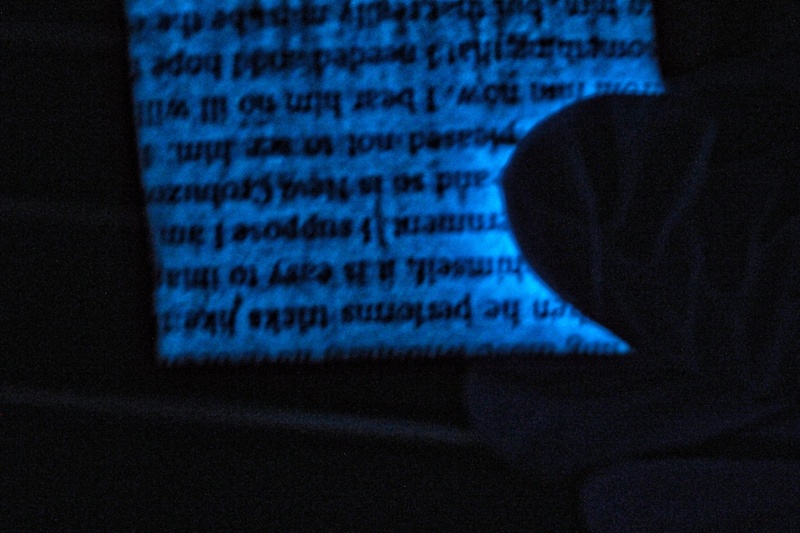 Held page, dark. 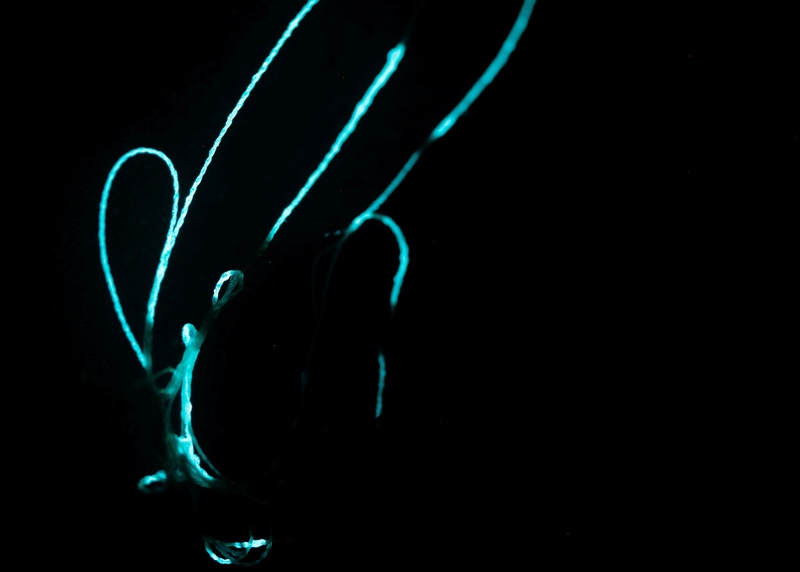 Note the increase in biolouminescence where it is being held. 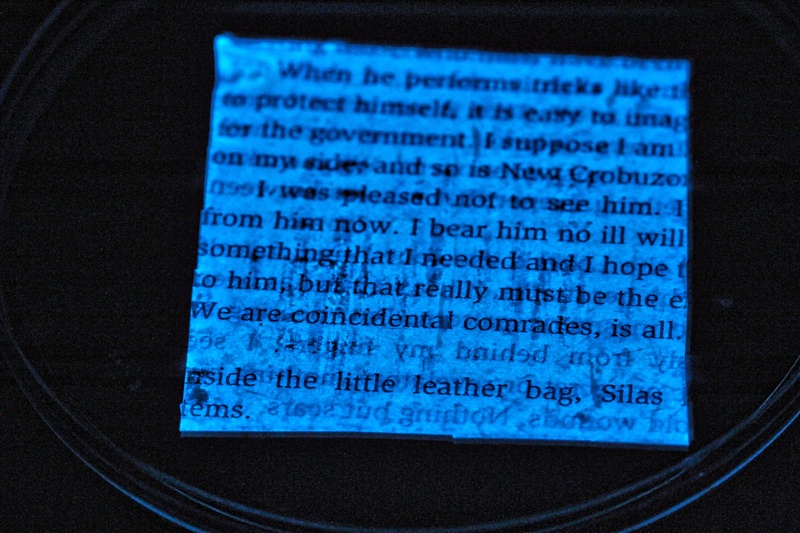 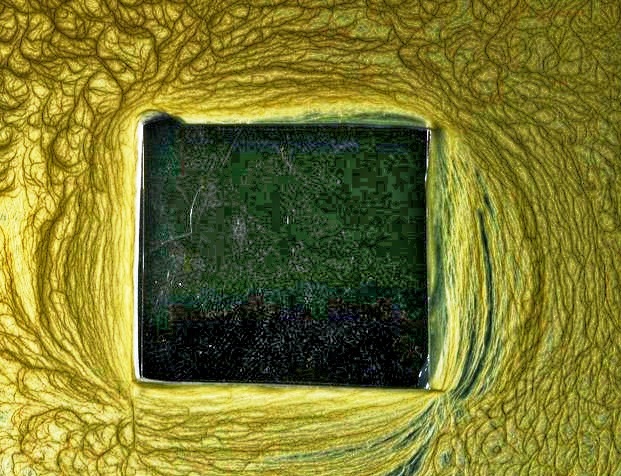 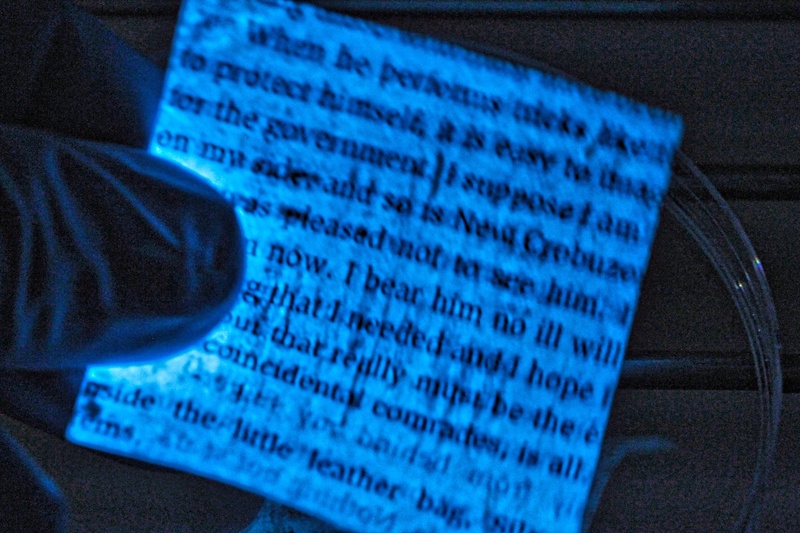 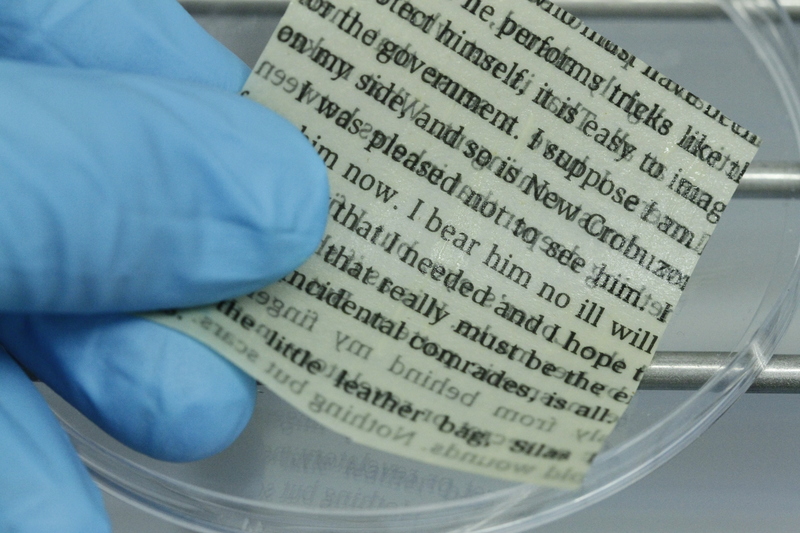 A page from a book carefully infused with living bioluminescent bacteria. 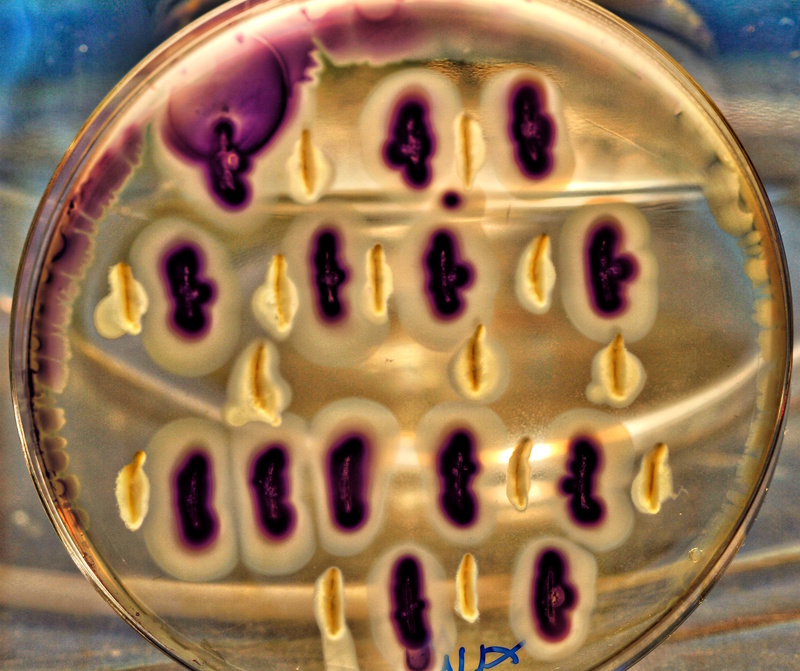 In a very simple sense, the bacteria self-illumnate the page so that it my be read in the dark without the need for unsustainable electric lighting. 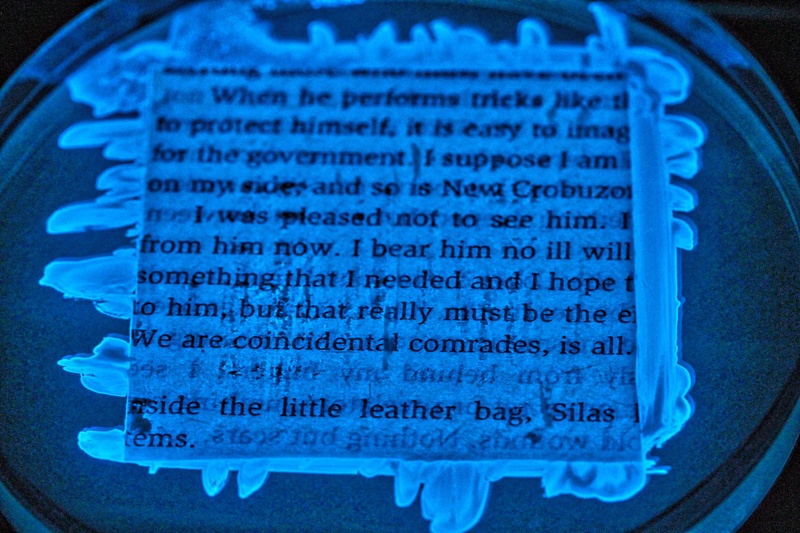 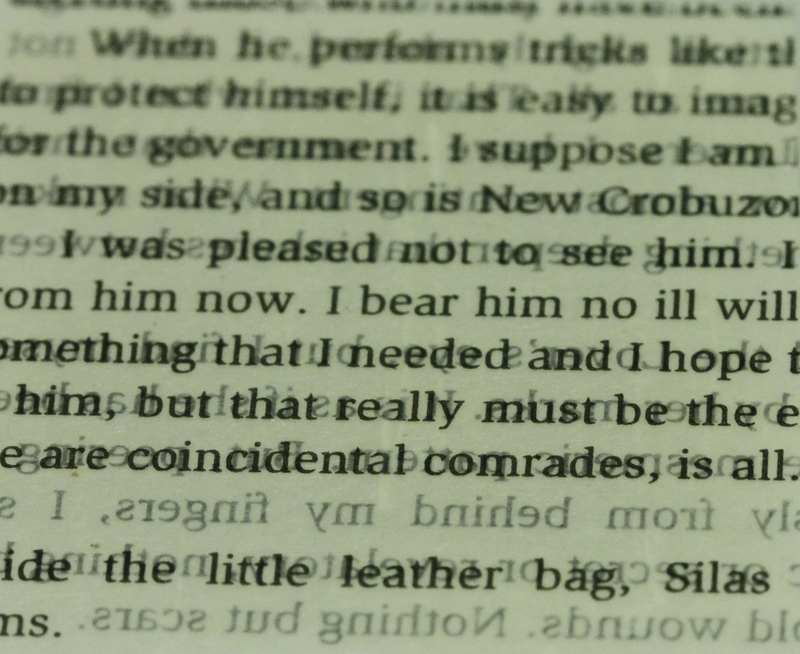 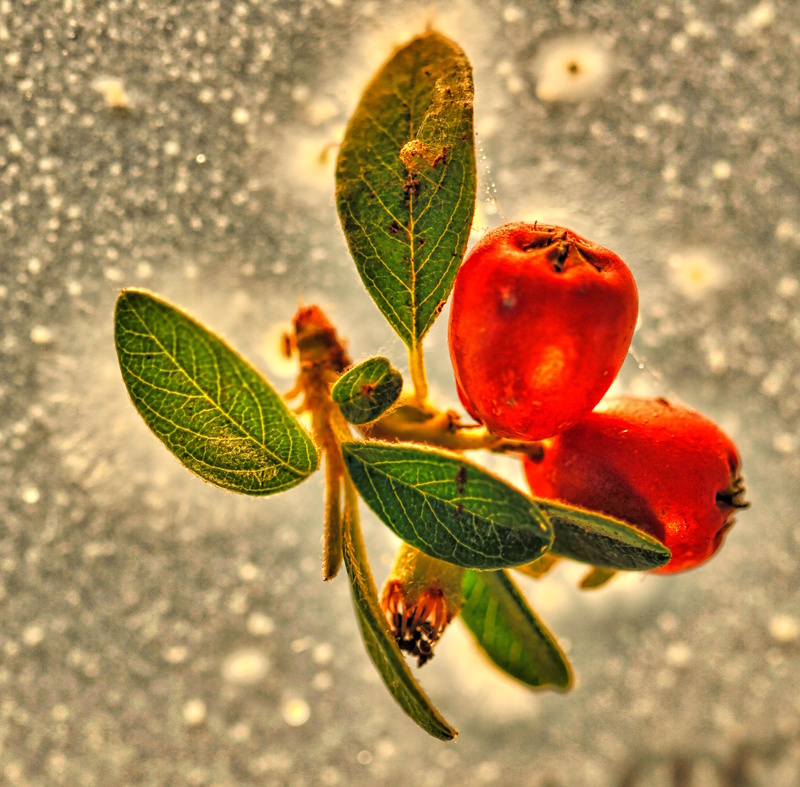 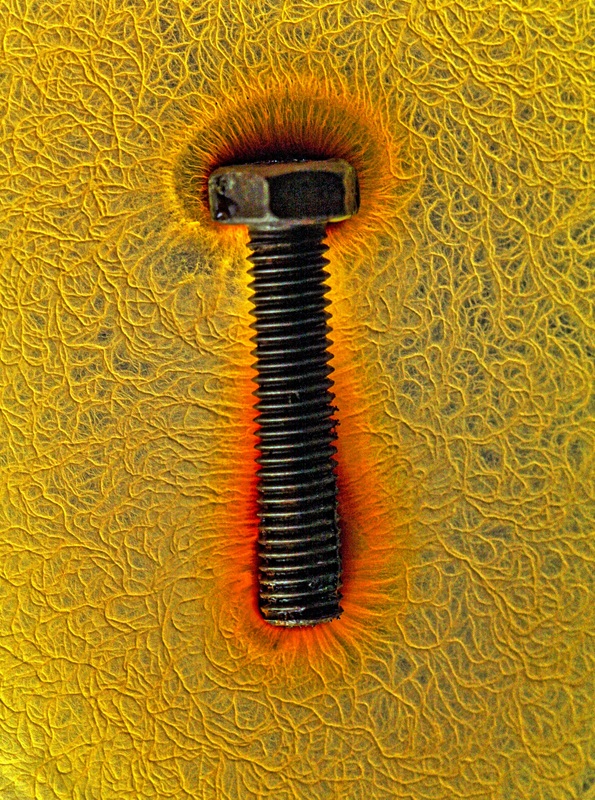 Beyond this, the bacteria suffuse that page with a unique and beguling energy of biological origin, the impact of which on the psyche, transcends the words written on the page. 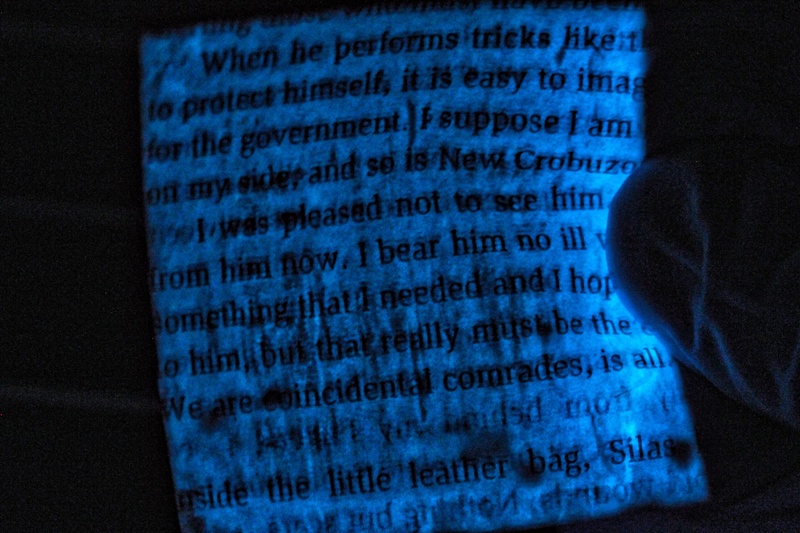 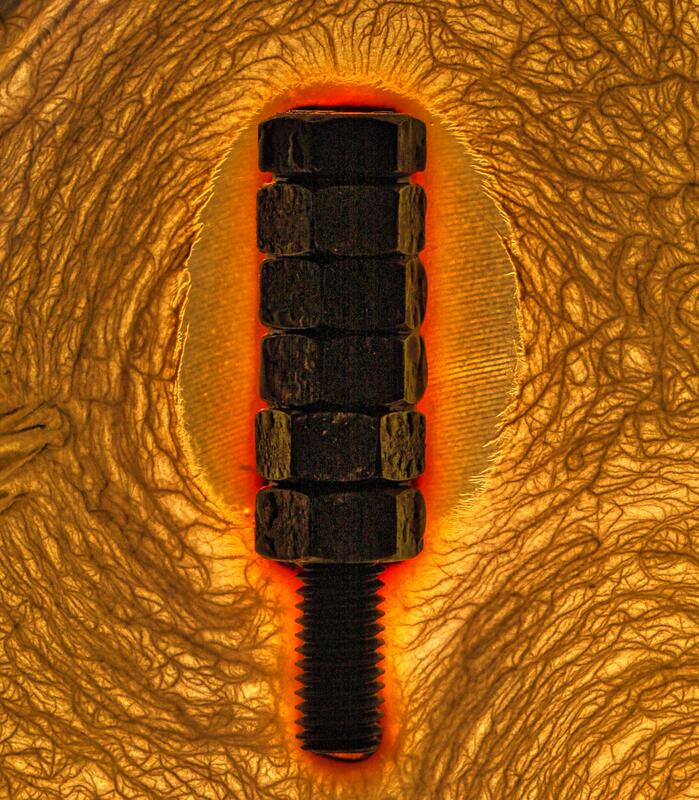 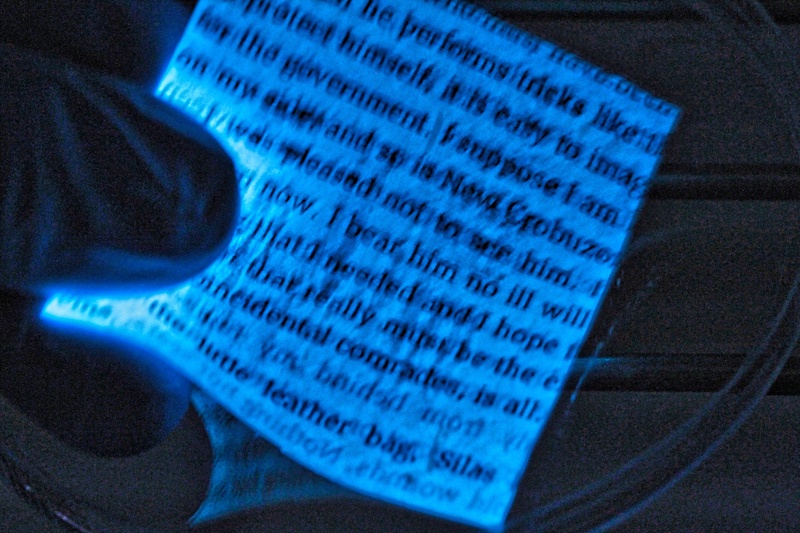 I was really shocked to observe that the page, and thus the bacteria, respond to my touch by glowing brighter! 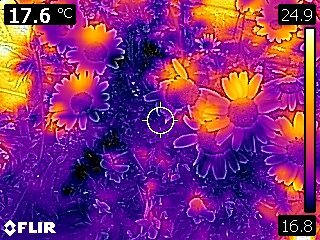 Possibly, due to changes in temperature, but remarkable nevertheless that there is a response.